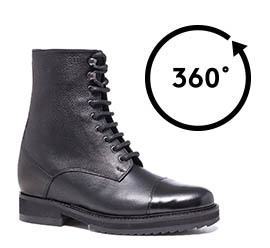 Boots with invisible inner elevator system up to 4 inches (10 cm), featuring upper made of black full grain leather and shiny black calf leather on the toe-cap. The tone-on-tone sole is made of durable super-light rubber. A stylish elevator shoe ideal to match with any casual outfit. Handmade in Italy.